To paraphrase the Beatles, it was 20 years ago this summer that a remarkable group of clinicians, academics and activists got together under the patronage of the billionaire philanthropist, George Soros, to create an initiative with the disarming goal of transforming the culture of dying – in a society that is perhaps more death denying than any other the world has known. Two women in particular – Dr Kathy Foley and Mary Callaway (pictured r. and l. here) – had a monumental role in driving this work forward over its nine years’ duration. 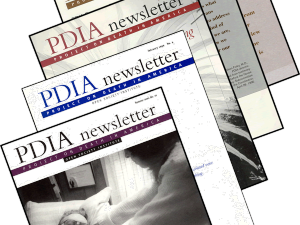 From 1994-2003 the Project on Death in America (PDIA) played a prominent part in end of life care innovations in the United States. As it came to a close I was asked to write a full account of its history and development – a work which appeared last year, published by Oxford University Press. Becoming operational in 1994, PDIA was George Soros’s first United States – based philanthropic initiative. In this post I explain how the initiative came about, how it was resourced, structured and governed – and the programmes which it developed and supported, together with some assessment of their impact. For a full account see my book – David Clark (2013) Transforming the Culture of Dying? The work of the Project on Death in America. New York: Oxford University Press, pp284. Why a Project on Death in America? When New York social worker Patricia Prem, an old friend of George Soros, was tasked by him to find out more about the provision of care for people at the end of life in the United States, she contacted a group of experts from clinical and academic backgrounds, as well as some policy oriented and community activists who might be able to help. Soros was enthused. By early 1994 a series of meetings was in train that culminated in the creation of an expert board and an offer of funding support from his Open Society Institute (now Open Society Foundations) to take forward an initiative in the area of death, dying and bereavement. Some $15 million was to be set aside over three years with the goal of improving the experience of death and dying in the United States. The board didn’t know it at the time, but they would eventually be given three times that amount across the whole lifetime of the project. The board charged with delivering the programme was handed a job of major significance both in terms of the level of resource and also the manner in which it would be deployed. The sense of responsibility was palpable. It soon became clear however that the board was an extraordinary cast of people’ which worked together in a manner akin to evangelists dedicated to the promotion of a cause. The members were open to the many proposals and suggestions that came to them, but also contributed a huge amount of their individual concerns and interests. 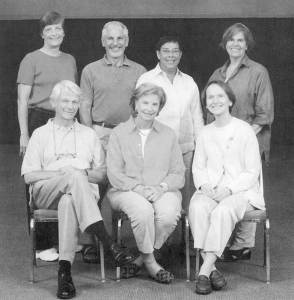 They had a great deal to draw on and encompassed high level achievers in academic and clinical medicine (Kathy Foley and Susan Block) and health related research (Joanne Lynn); they included a distinguished historian and social critic (David Rothman) , a social worker (Patricia Prem) and social activist (Velvet Miller, a geriatrician (Robert Butler) and a lawyer (Robert Burt). The talents of the board were indeed extensive and they needed to be, for as one member put it, the brief they had been given by Soros ‘was breath-takingly open-ended’. Just 10 individuals served on the board through the lifetime of PDIA – five of them for the full duration. Throughout the period palliative care leader and distinguished neurologist and pain expert, Dr Kathleen Foley held the unusual position of being a member of the board and the Director of the project. Her leadership was inspirational. She was supported throughout at the executive level by Mary Callaway – who for many grantees was the day to day point of contact with PDIA’s extremely modest infrastructure. The modus operandi of the board was ‘hands on’ and it engaged in depth with applications for funding, with monitoring progress of grantees, as well as with strategy and longer term direction. Throughout the lifetime of the project the board was the key driver, shaping programmes, seeking out new opportunities, setting policy and reviewing progress. It resulted in a rich, varied and extensive portfolio of initiatives over almost a decade. We have created a medical culture so intent on curing disease and prolonging life that it fails to provide support during one of life’s most emphatic phases – death. Advances in high technology interventions have deluded doctors and patients alike into believing that the inevitable can be delayed almost indefinitely (Soros 1998, p5). The speech identified three major recommendations: improved training for professionals involved in the care of the dying; the adoption of a comprehensive Disease Related Group (DRG) for the funding of terminal care in hospitals; and increased availability of hospice services for terminally ill patients, without restrictions on admission and reimbursement. With such a challenging brief, the PDIA board sought from the outset to foster cooperation and collaboration among the various professionals with cognate interests already working in nursing, medicine, social work, ethics, policy, financing, as well as philanthropy and the media. Encouraged by Kathy Foley as chair, the board developed a regular practice of identifying experts from different disciplines, and convening meetings to map the field and determine the most pressing needs. In 1995, PDIA announced a grants programme to address seven priority areas for funding, hoping to cast a broad enough net to address the many significant areas of need. It was in a context of ‘complete freedom to formulate our own agenda for transforming the culture of death and care of the dying’ (PDIA 2004 p17) that the program emerged and in which two interlocking themes were dominant: the harms inflicted by the medical system on dying people and the harms caused by public attitudes about death itself, the so-called ‘denial of death’. The seven areas to be covered ranged from epidemiology and ethnography to the shaping of governmental and institutional policy. In both its size and range the response to the Request for Applications (RFA) was overwhelming and it became the perfect tool to assess the range of interest in death related topics across America. But in practice it also led to a very broad range of initial investments, some of which bore fruit whilst others did not. In its first three years, PDIA received more than 2,000 grant requests over four grant calls and it funded 122 projects in the seven priority areas. The board chose to fund a broad range of initiatives to reflect the complexity of the medical and societal challenge of providing appropriate, compassionate care to dying people and those close to them. Eventually, three grant cycles unfolded as the PDIA was extended from three years to six and then to nine. From an early stage the PDIA board began to forge the view that it was essential to change the culture of medicine in hospitals and nursing homes, where 80% of Americans die. The board envisioned a national network of role-model health care professionals—nurses, physicians, and social workers—who would serve as champions of palliative care in their institutions. More than half of PDIA’s funds were eventually to be used to support professional education initiatives. Central to this was the PDIA Faculty Scholars Program. In total 87 individuals (52 men and 35 women) in eight cohorts were supported by the Program. Medical professionals dominated the program overwhelmingly. Medicine, oncology, geriatrics and psychiatry were the prominent disciplinary backgrounds, with just 10 nurses and three social scientists taking part. The Scholars represented a total of 59 medical schools, 10 nursing institutions and two universities. For the most part each Scholar was funded for three years. The Faculty Scholars Program became hugely influential. It was widely regarded on the board as being the single most successful aspect of PDIA and the 87 Faculty became among the most prominent and active leaders of palliative care in the United States. There were those in the board who considered that this model could be extended to other professions and that indeed there was a need to address the heavy physician dominance of the program by promoting the work of other groups involved in end of life care. Most obvious among these was the nursing profession. PDIA supported nurses through a Nursing Leadership Institute in End of Life Care to advance the profession’s agenda to improve care at the end of life by increasing relevant leadership capacity of nurses. Some board members also argued – in the face of resistance – for greater prominence to be given to social work perspectives in end of life care. The result was the Social Work Leadership Program, which began in 2000 and encouraged social work applicants to submit proposals addressing a critical issue in the care of the dying. Especially sought after were projects that addressed the design, implementation, and dissemination of research on new social work service-delivery models for the dying and their network of family and friends. This late rally for social work within PDIA led to a program involving 42 social workers – 50% academics with PhDs and 50% with Masters qualifications and working in direct practice. These major professional development programmes took a significant share of the PDIA budget, but funds were also used in innovative ways to support a variety of other activities, reflecting the board’s inclusive approach to transforming the culture of dying within American society. I discuss these elements in detail in the book and examples were reported regularly in the PDIA newsletters. One approach was to make alliances with other foundations and philanthropic groups to raise awareness about end of life issues and to promote more interest in grant making for improved end of life care. In a climate of growing interest among private foundations in the subject of end of life care, PDIA joined forces in 1995 with the Robert Wood Johnson Foundation, the Nathan Cummings Foundation, the Rockefeller Family Office, and the Commonwealth Fund to form Grantmakers Concerned with Care at the End of Life. This coalition organized conferences and shared information in order to inform funders about major social, economic, and medical issues in end of life care and to encourage them to address those issues in their grantmaking. A similar initiative occurred in 2002, when PDIA and the Emily Davie and Joseph S. Kornfeld Foundation formed the Funders’ Consortium to Advance Palliative Medicine. This alliance supported existing and new palliative care fellowship training programs with the goal of helping to increase the numbers of physicians with advanced training in palliative medicine, and thereby make a contribution to the wider goal of obtaining formal recognition as a medical subspecialty with the Accreditation Council for Graduate Medical Education and the American Board of Medical Specialties. In 2006, the Council and the Board approved and recognised the new specialty in hospice and palliative medicine, and formal certification of physicians and accreditation of training programs began in 2008. PDIA launched an arts and humanities initiative in 1998. Grantees produced film, photography, poetry, essays, dance, and artwork to express individual and community experiences of illness, death, and grief and encourage conversation and thoughtful reflection. Again, there was not unanimity on the board about the success of this initiative. Nevertheless, the arts and humanities programme funded an innovative range of projects – capturing cultural expressions of death and dying in exhibitions, theatre, film and video documentary, poetry, photographs and essays, performance work and even the unusual medium of fabric and thread work. It made 14 grants to 13 grantees and highlighted the role of creative artists in giving form though language and image to experiences at the end of life, to promoting expressions of illness, death and mourning, and thereby helping to ‘identify leverage points for change within our society’ (PDIA 2001 p40). In 1999, a community grief and bereavement initiative was launched. From interfaith, community-based, and school-based programs to programs for special groups such as incarcerated youth or union home health-care workers, grantees created programs to support individual and community bereavement. PDIA also chose to address challenging legal and economic barriers, and to improve access to care for particularly vulnerable populations and those socially excluded and denied access by the health care system. These underserved groups included children, elderly persons, non-English speakers, those incarcerated, the homeless, ethnic and cultural minorities, and people with physical or developmental disabilities. PDIA also launched an initiative to improve palliative care in the African-American community, recognizing that members of this section of the population use relatively few palliative and hospice services, even when they have full access to them. Little data existed to explain this phenomenon, although historical denial of access to health care and past abuses in medical research may have contributed to a general mistrust of the health care system (Brunner, 2009). This initiative sought to define and promote a research, education, and policy agenda and to build coalitions among organizations and stakeholders working in the African-American community to promote palliative care. In 1998, when 1.83 million men and women were incarcerated in prisons and jails across America, more than 2,500 prisoners died of natural causes in state and federal correctional facilities. Longer sentences and fewer paroles, coupled with the increasing age of prisoners, were also contributing to the increasing numbers of terminally ill inmates. In response, PDIA and the Center on Crime, Communities, and Culture, another OSI programme, co-sponsored the first-ever meeting devoted to the growing problem of caring for the dying in prisons and jails in order to define the issues and explore possible solutions. PDIA also supported the production of a compelling video documentary on one of the nation’s first prison hospice programs at Angola Prison in Louisiana, involving inmate volunteers trained to care for other dying inmates. As a result of these efforts, a series of ongoing initiatives was developed to advance the care of dying prisoners through the creation of educational initiatives for prison health care professionals and associated policy changes. In collaboration with the Robert Wood Johnson Foundation, PDIA supported the development of national guidelines for palliative care in America’s prisons and jails. During the final year of its nine year and $45m operation, the staff and board of PDIA reviewed the original funding strategies, goals, and individual initiatives in the light of an end to OSI funding. The need for an exit strategy proved a painful experience for those concerned, who found it hard to imagine the programme ending. The exit strategy focused around support for a number of key organisations active across the United States in the field of end of life care. One major beneficiary stood out however and this was the American Academy of Hospice and Palliative Medicine – a physician-based professional organization dedicated to advancing practice, research, and education in palliative medicine. PDIA awarded a $1.2 million grant to the Academy to support its infrastructure and to strengthen its ability to serve the needs of palliative care professionals through the creation of an academic “college” to house the legacy and leadership of the PDIA Faculty Scholars as well as to strengthen the Academy’s capacity to support and nurture academic leaders in all fields and to expand its role in the promotion of interdisciplinary professional education in palliative care. In contrast, other ‘exit grants’ were relatively modest. Three groups each received a grant of $200,000: the Hospice and Palliative Nurses Association; the Social Work Summit on Palliative and End of Life Care; and the National Hospice and Palliative Care Organization. Two grants of $100,000 dollars each were awarded to: the Harvard Medical School’s Programme in Palliative Care Education and Practice and to the American Board of Hospice and Palliative Medicine to implement standards for fellowship training programs in palliative care and to begin the application process to make palliative medicine a subspecialty. Over 2.5 million individuals die in the United States each year. Many more tens of millions are affected as bereaved relatives, companions, friends and caregivers. PDIA drew attention to this set of social circumstances and sought to explore the consequences and implications – and most importantly what might be done about it. From its beginning, PDIA focused on the vulnerable and voiceless individuals who had, in a sense, been abandoned by the health care system. Their suffering suggested ways in which modern high-technology medicine had lost its way. PDIA took the view that palliative care and treatment enhance the field of medicine and demonstrate the importance of both competence and compassion in modern healthcare practice. The goal of PDIA was ambitious and at the same time un-measurable: to transform the culture of dying in the United States. This was a huge societal challenge to be taken on by a fixed term program funded through private philanthropy. PDIA was a necessary but not sufficient condition for such a transformation to take place. Like many innovative ideas, the Project on Death in America started from modest beginnings, and these burgeoned beyond the earliest imaginings of those involved. For George Soros, it grew out of personal experience, which led in turn to an interest in the wider scenario of death and bereavement in American society. For those who took up his challenge, it set in motion an exhilarating journey that encompassed diverse communities and cultures across the United States, as it sought to engage with complex ethical and legal issues and to tackle questions of public policy, finance, and professional regulation. It brought with it a heady mix of surprise, opportunity, and innovation, coupled with a determination to embrace the scale of the task and a commitment to getting on with the job in the best way possible. It called for difficult decision making in the face of grant seekers from so many backgrounds and with varying levels of expertise. In turn it required vision, energy, and strategic planning in order to make the biggest impact with the available resources in the time available. Ultimately it called for a willingness to take hard decisions about the focus of the project and, in due course, to decide how it should end. Brunner, B (2009) The Tuskegee Syphillis Experiment. Tuskegee: Tuskegee University; see http://www.tuskegee.edu/Global/Story.asp?s=1207586, last accessed 24 September 2009. Kaufman, M T (2003) Soros. The Life and Times of a Messianic Millionaire. New York; Vintage Books. Ostrower, F (1995) Why the Wealthy Give. The culture of elite philanthropy Princeton; Princeton University Press. PDIA (2001) Project on Death in America, January 1998- December 2000, Report of Activities. New York: Open Society Institute. 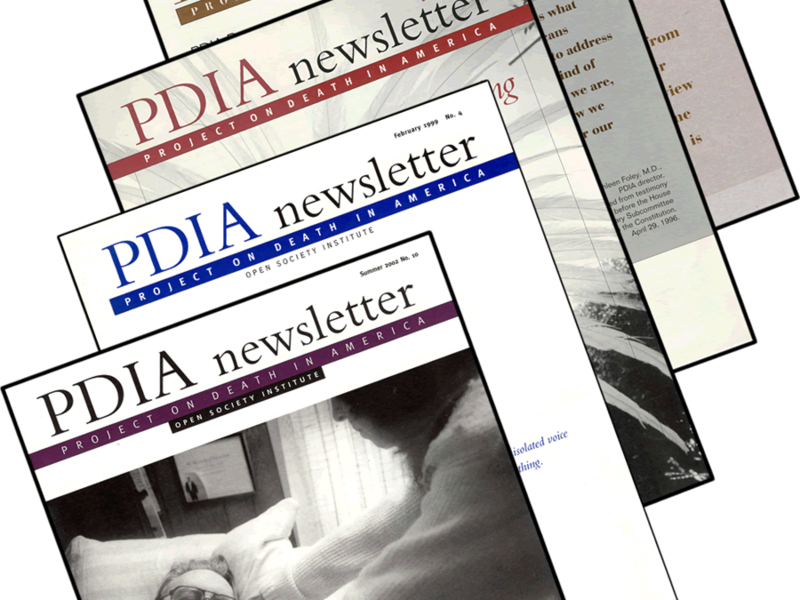 PDIA (2004) Transforming the Culture of Dying. The Project on Death in America October 1994 to December 2003. New York: Open Society Institute. Soros, G (1998) Reflections on death in America. Project on Death in America, July 1994-December 1997. New York: Open Society Institute.